The unique thruster technology of Copenhagen Subsea A/S reduces downtime and improves the success rate of subsea operations in several ways. Ten years ago, the conventional hydraulic thruster was the only option for underwater propulsion. The conventional thruster was also by far the most vulnerable component of the subsea vehicle. Technically, the conventional thruster is constructed as an atmospheric housing with pressure shaft seals, or as an oil-filled ambient pressure container. With several breakdowns and considerable maintenance costs as the undesirable result, this thruster was the weakest link in the chain of operation. The market for underwater propulsion was ripe for a substantial re-thinking of technology. 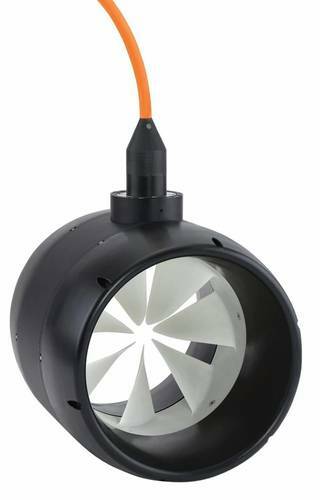 In order to meet the industry’s new and higher demands for reliable thrusters and decreased operating costs, the solution was to construct a new product-line of electrical rim-driven thrusters. Building on the innovative ring thruster technology, Copenhagen Subsea A/S has been able to develop and manufacture four thruster sizes — from VS as the smallest to VXL as the largest — that show a significant increase in reliability. The rim-driven thruster is a tight integration of motor parts within a housing. The electrical motor takes the form of a thin ring that has permanent magnets fixed to its rotor. This rotates within the stator arrangement of magnetic flux. The housing remains fixed to its platform on the subsea vehicle. The propeller — the only moving part in the rim-driven thruster — rotates within the nozzle, eliminating the need for a drive shaft and hub. Speed and direction are managed by a motor controller. All thruster models from Copenhagen Subsea have been rigorously tested to secure optimal performance. In a test-tank located on the premises in Hellerup just north in Copenhagen, Copenhagen Subsea A/S performs continuous testing of their thrusters. 1,000 hours of operating time in fact comprise 42 days during which the thruster operates 24/7 at maximum power. During this period, the thruster is constantly monitored for performance and energy consumption, and any aberration is registered. When reaching the milestone of 1,000 operating hours, the thruster is carefully examined and, showing no signs of exhaustion or corrosion, allowed to continue operation in the test-tank. The operational limit have yet to be explored, since the thrusters at all times during and after the test have shown that they maintain full functionality and unaffected performance. The maritime subsea market demands larger thrusters, increased thrust force and less downtime. However, simply upscaling the existing technology would pose a number of challenges. Materials and aspects of the manufacturing process must be considered anew, and the right entrepreneurial solutions applied. With the product line of innovative rim-driven thrusters, Copenhagen Subsea A/S is in a unique position to drive this development. Acknowledging this unique position, The Danish Maritime Fund in 2016 decided to support Copenhagen Subsea A/S in the development of a new and powerful electrical subsea thruster. Due to the unique design, the surrounding seawater cools the thruster and enables operation at maximum power for extended periods of time. The result is exceptional high thrust force compared to conventional thrusters. Following two years of engineering and testing, the VXL was launched in early 2018. The VXL is the largest thruster in the portfolio of Copenhagen Subsea A/S today. With a propeller diameter of 236 mm, the VXL will deliver a thrust force of up to 2.800 Newton. This output makes the VXL a real alternative to conventional hydraulic thrusters. Low propeller inertia and high motor torque result in fast response when changing thruster RPM. Fast response makes the underwater vehicle highly maneuverable, provide accurate results, and improves working conditions for pilots. High thrust force makes precise navigation possible, even in strong currents. The advantages of the VXL are many. Like the smaller models in the portfolio of Copenhagen Subsea A/S, it has only one moving part. This means no entanglement and dramatically minimized downtime compared to conventional thrusters. Reliability continues to be of crucial importance in subsea operations. 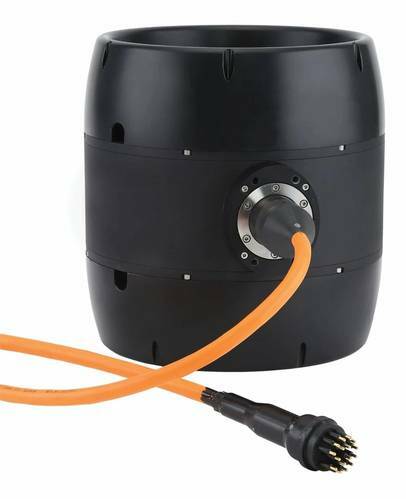 The compact design, with a solid black housing of only 318 mm in diameter, makes the VXL adaptable to most ROV, AUV and Manned Submersible applications. Like the smaller VS, VM and VL models, the VXL comes in three different configurations: Symmetric, Asymmetric and Compact, according to the specific needs of the client’s mission. Sustainability and environmental issues are important in subsea operations today. There is a heightened awareness of not disturbing marine life. The technology of the electrical rim-driven thruster not only improves reliability, it also makes the rim-driven thruster the right green choice. The first green advantage is the acoustic profile. The innovative electrical design has no gears, only one moving part and bearings that make use of the surrounding seawater for lubrication. 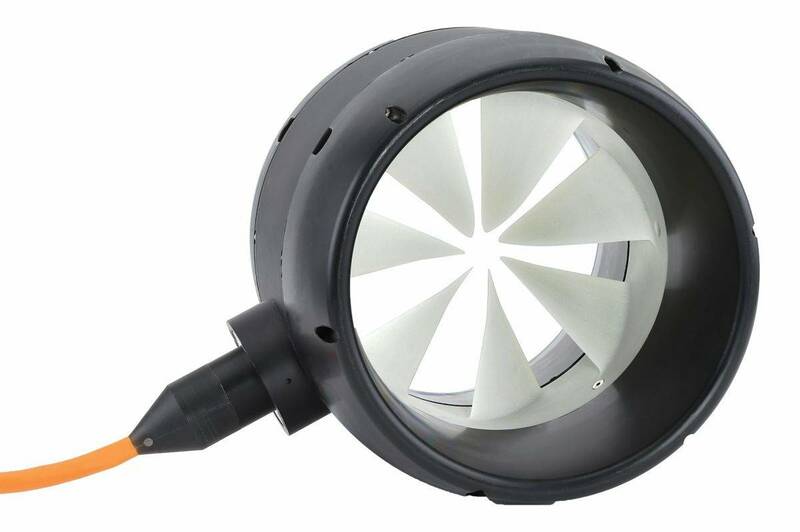 These unique features lead to significantly reduced sound levels and minimal disturbance of surrounding marine life. The second green advantage is that the risk of spillage is eliminated completely. Compared to conventional thrusters, which use a fluid for pressure compensation, the thrusters from Copenhagen Subsea A/S use only the surrounding seawater for lubrication. There is no oil or other lubricant inside the thruster. This means absolutely no risk of spillage, and no damage to the surrounding sea life.